Benedict resigned on February 11, 2013, having served as pope since 2005. This decision, as he admits, “was not easy and was pondered upon for a long time,” beginning in 2009. He resigned not because of an interior conflict or clinical depression, but in full awareness of the responsibility of his choice and after a profound examination of conscience. Why did he do it? Was it cowardice, as some of his critics said, or maybe depression, as some of his supporters suggested? Did he flee his duties? Should he have stayed through illness and decline the way St. John Paul II had? He took guidance was from the medieval holy hermit of Aquila, Italy, St. Peter Celestine V, who had not wanted to be pope and in 1296 resigned his papacy after five months. In April 2009, Benedict visited and prayed at his tomb in the main church of Aquila. Probably, this was the first, then un-noticed sign of a profound spiritual connection between Benedict and Celestine. A year later, Benedict revisited the relics, on the occasion of the celebration the local bishops had proclaimed to mark the 800th anniversary of Celestine’s birth. The “Holy Alliance” between two highly spiritual men was unfolding. Although the medieval monk, his love for seclusion and his spirituality provided Benedict with a spiritual pattern and a legal precedent for papal resignation, it took two more years of discernment for him to make a definite decision. It was during summer 2012, “while conversing abundantly with the Good Lord,” that he made his decision to resign. His brother, Fr. Georg Ratzinger, was among the first to know. Why did Benedict resign in 2013? In the interview, he denies any signs of depression, but he admits that his medical condition in 2012 was not the best. He felt fatigued and fragile after the trips to Mexico and Cuba and “the doctor has advised him not to cross the Atlantic anymore.” World Youth Day in Rio de Janeiro, Brazil, which was initially planned for 2014, had re-scheduled for 2013 due to the World Cup being played there the next year. Time was pressing for Benedict to announce his resignation, so that the new pope would be elected and be able to attend the WYD in Rio. Why did he chose February 11 as the date of the resignation? He admits that he was not aware that the day was Carnival Monday in Italy. He expressed some concern that in Germany February 11 is the feast day of the Madonna of Lourdes. He did not suffer that particular day, or have a sleepless night before it. It was a morning and a routine like all other days: neither early wake up nor early breakfast. Last Testament helps us understand how Benedict understood his resignation. He explains that he resigned the papacy, but that he did not and theologically could not abdicate his ministry. His commitment and service to the people and the Church remains although exercised in a new way. He notes that priests and bishops remain “padre” no matter what, even after their active ministry. “They keep the assumed responsibilities internally, but not in the functions.” For him, the resignation meant “an end of the concrete service,” but not of his papal ministry. His resignation brought the Church to reflect more deeply on the spiritual and prayerful ministry of the clergy after they retire. What is the heart of that ministry? For Benedict, the pope is called to be a Cross-bearer. The peoples’ and the world’s problems are his problems. The pope has the title “Vicar of Christ,” he says, because his authentic place is at the Cross. Consequently, the pope will always “be a sign of contradiction and contradiction will be his distinctive characteristic,” as he explained in the interview. 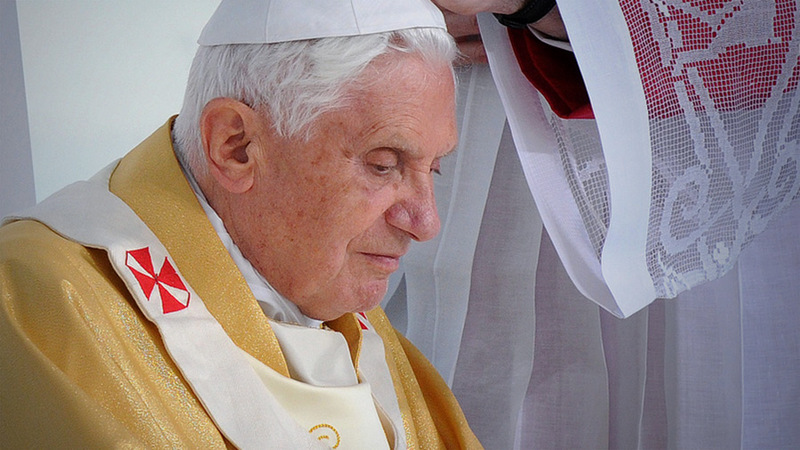 According to Last Testament, Benedict did not resign under any kind of pressure. He was not fleeing from the world’s problems nor from the Church’s internal problems. He was not abandoning his commitment or his service to God’s people. His resignation wasn’t an act of cowardice. According to the interview, the pope emeritus was and is at peace with his decision, humbly admitting that “the pope is not a superman” and when he resigns his active functions, he continues his responsibilities, ministry, and commitments internally, spiritually. In other words, he carries the Cross internally. He cannot cease to serve. With his heroic and humble resignation, Benedict XVI introduced a new institution in the Church: the pope emeritus. The pope emeritus will continue to assist the Church with his prayers, as the “grandfather of all grandfathers,” as Pope Francis said. People like myself who have been blessed to have been raised by grandparents know exactly what Pope Francis means by having a wise grandfather at home. Thank you for this interesting and respectful understanding of Roman Catholic Christianity. We see too many so-called Evangelical Christians and others blogging at The Stream who are hideously hateful against Catholic Christians, and other Christians, that they do not understand and do not like. I agree that sometimes comments here express a deep anti-Roman Catholic sentiment. If only Protestants knew the line in our morning offering prayer “for the reunion of all Christians,” maybe the misconceptions could be dispelled. We can only hope.